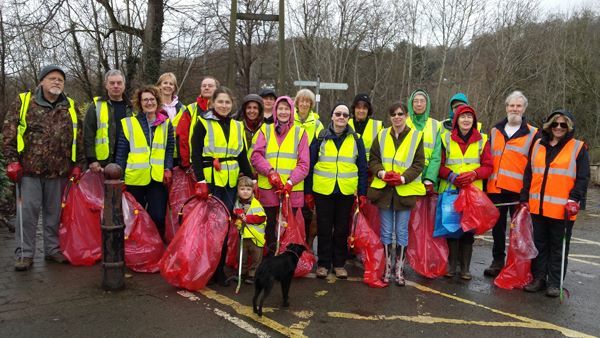 The River Severn Custodians recently joined the members of Walking Newtown in a litter pick around Dolerw. Below is a photo of the people who took part. Many thanks to all who took part in this very successful event. We’ve had our new camera traps set up along the river in a couple of places. Still learning the best technique but we’ve captured birds, squirrels, foxes and a bit of badger so far. Mike and I were watching the grayling that seems to be resident just off Long Bridge. You can see her/him any time the water is clear. A couple of people stopped to watch with us and today we saw two of them. Just look at the two large flat rocks downstream of the bridge and we can almost guarantee you’ll see a fish. The slippery and treacherous footpath down to the river has now been replaced with a set of safe steps, thanks to the efforts of Walking Newtown. 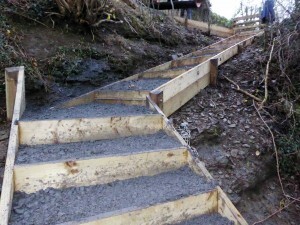 It is now easier for all to access the river. Some weeks ago Joan Avery reported sewage smells coming from the Severn by the new construction at the old Boys and Boden site. We reported it and a couple of days ago the Natural Resources Wales called again to say they’ve reported it to Severn Trent. They didn’t find sewage when they investigated but they have noticed stuff going into the river that should not be there. Severn Trent should investigate eventually but in the meantime, NRW asked us to report immediately if anyone sees or smells anything unusual again. The hotline, which we should all have in our mobiles, is 0800807060. Last week Joan reported that the stream running into the Severn near Canal Rd and Sycamore Drive was a peculiar colour from discharge. Tonight when Mike and I were walking by there was a strong smell of sewage at the stream. We decided that with these two incidents it was worth a report to Natural Resources Wales. So we called the 0800 807060 number from our mobile, and talked with a real human being (after pressing 4 for Wales)! The answering service got hold of someone in Cardiff who called back quite quickly. Because of all the gas works in the area, he suggested his first action should probably be to contact Wales and West Utilities and Severn Trent to see if the problem was already known. They might have gone through another sewage pipe. After all, they did puncture ours while working in Golwgydre Lane. If not, someone will be sent out tomorrow to investigate. We will keep you in touch. If anyone else smells anything in the meantime, please let us know. The RSC will undertake to do a full year survey of birds along the river. So far several members have signed up to participate so we will wait a little longer and then set up an initial meeting to kick the project off. If you are interested in taking part, please contact us (Mike or Paula) to let us know you’ll be joining in. It should be interesting and rewarding. This is posted on behalf of Pete Thomas, our resident fish man. A few weeks ago my wife pointed out an eel down stream of Long Bridge, it was close to a metre long ! Later on in the evening on our way back, we spotted two eels about 500 mm in length and feeding under the rocks while making their way up-stream. An amazing fish with an even more amazing life story. Yesterday on my daily early morning walk I spotted a kingfisher flitting up and down the river opposite the Regent Centre, having not seen one for some time. Finally, I notice there are some items in the river i.e. large and small toy trucks, bicycle etc. Are we able to have a couple of hours to pull them out if I pinpoint them? Note from Mike: I’ll talk to Sue of Keep Wales Tidy to see if she wants to organise a river clean up. a Stone Loach, probably a female, as the tail stripes are more pronounced. 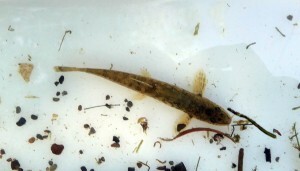 The fish is a night feeder, with barbels on its mouth to assist in finding food. It likes stony streams, and won’t tolerate pollution. As the result of Mike receiving an email notification of Giant Hogweed in the Vaynor area, I took a walk from the Halfpenny Bridge to Vaynor, in search of any offending plants. I managed to find 3 x 7ft high specimens and 8 smaller plants, which I managed to dispose of. You can see from the photo that the large specimen Hogweed at Vaynor, was accompanied by some Japanese Knotweed, which I had to cut down in order to get at it. As I commented in an earlier post, the Hogweed at Vaynor wood appears to be under control with very little re-occurrence of the weed after our clearance work there earlier this year. This is a battle that we will never win, but at least we are maintaining a safe river bank for people to enjoy and this is what the RSC’s work is all about. 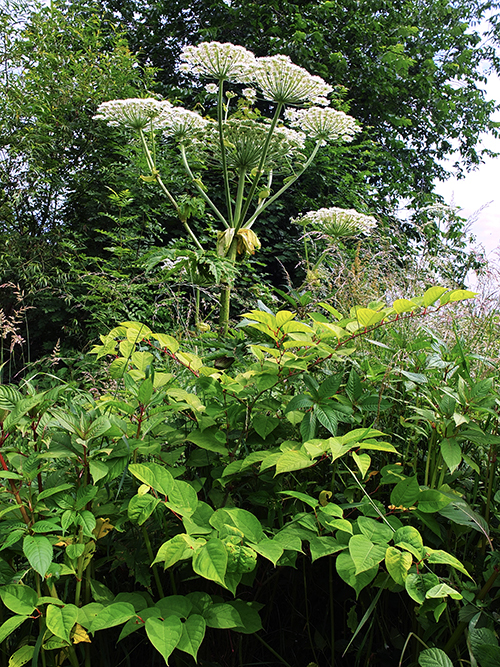 Giant Hogweed & Japanese Knotweed. 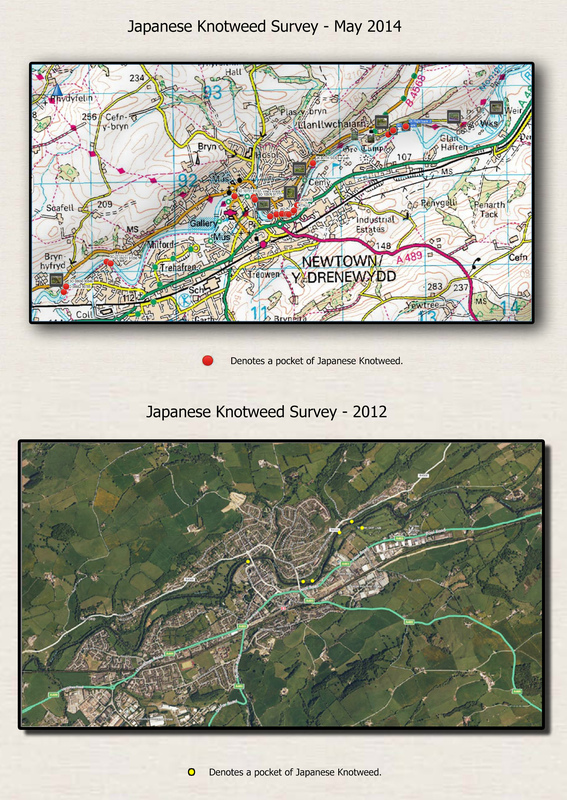 A survey of the Japanese Knotweed has recently been carried out by Paula Scott, Mike Davies and Russ Edwards. The photo below shows the results of the current survey and those of the previous survey in 2012, for comparison. It is quite alarming how this invasive plant has spread in that short period of time. 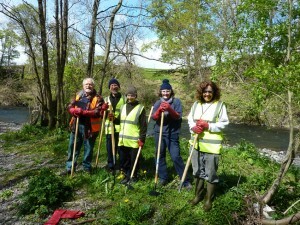 A team of 7 Custodians went to the area where the Mochdre Brook enters the Severn and tackled the dread Giant Hogweed again. This is the site that we have visited regularly and believe that we are making a difference but we can still find plenty of Giants to slay every time we go there. It is a lovely place to be anyway, especially when the weather is kind as it was this morning. Thanks to all those who volunteered. While doing our sampling of the river fly larvae yesterday we caught a 4 inch lamprey in addition to a huge number of critters. First time we’ve seen one in the river. The latest results for the fly larvae are on the web site under water quality. 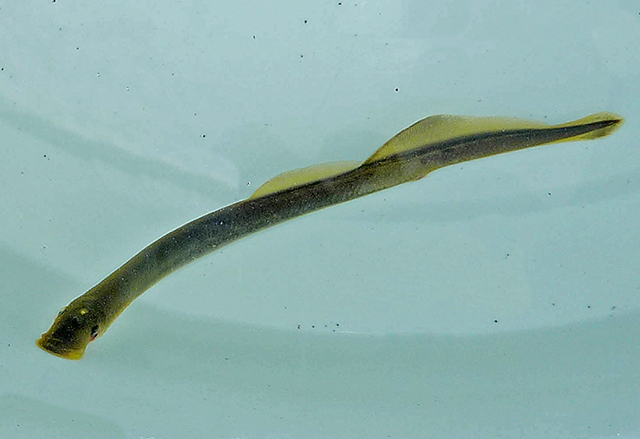 Lamprey caught during River Fly Larvae survey. We have just heard that Andy Dodgson, Outdoor Recreation, Powys County Council is available to meet with us tomorrow (Friday) afternoon to discuss the location of these boxes. We don’t yet know where or when but probably in the area of Dolerw Park. This is very short notice but if any of would like to be involved and are available please let me know asap and I’ll let you know details once I get them from Andy. As most of you know we have been expressing concern about possible contamination of the river from activities at this PCC depot. There is now a planning application for this depot which should eliminate this possibility once the depot staff have submitted and carried out specified work. Thanks to Sue Newham for bringing this to our attention. I will continue to monitor this application and report on progress but if you want to take a look the application ref is P/2013/1121 on the PCC web site planning page. 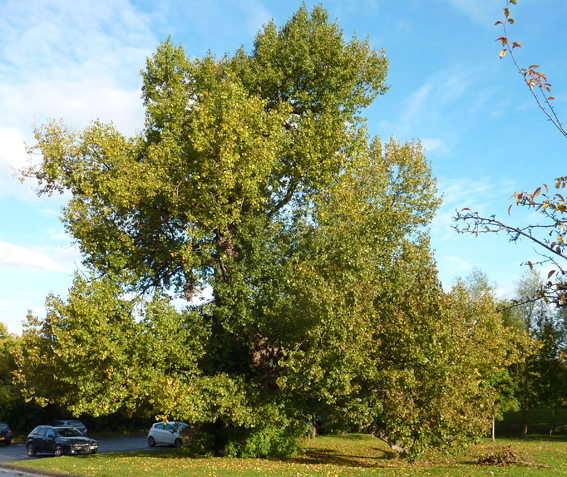 Paul Mounsey recently asked me whether the Black Poplar tree in Gravel car park was protected by a tree preservation order (TPO). It is not. 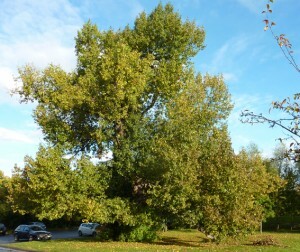 The tree in question is an ancient Black Poplar, located at British national grid coordinates of the tree: SO 11067 91537. This tree, apart from being extremely rare (we understand that the nearest other specimen is in Somerset) and very old, is iconic in Newtown since it was ‘moved’ from one bank of the River Severn to the other when the river was moved for flood defence purposes. Some years ago a large part of the tree was removed apparently without much, if any, consultation and we should like to ensure that any future work is carefully considered. The tree is currently being crowded with elder trees and choked with ivy so presumably some work is likely in the near future. On behalf of the River Severn Custodians I requested that a TPO be issued. Since posting the above, the Planning Clerk of PCC came back to me to correct the information previously given. This Black Poplar Tree has got a Tree Preservation Order on it, T P O number 113, it was given the order on the 7/12/2011, so all’s well with the world. I have been working on the water quality data for our stretch of the Severn and have begun posting it on the web site for anyone interested. These data are hard to find from the government so we’d like them to be more available. It’s a work in progress and more will be added but you can check it out under Water Quality Data on the site. Paula and I did a very interesting one day training in catching and identifying river fly larvae. It was held at the visitor centre at Lake Vyrnwy and included classroom and in river training. We were also provided with all the necessary equipment. We are now fully trained and registered with the bodies monitoring larvae in the rivers of the UK. These data are collected nationally and are used to monitor the health of the rivers. We have to test the same location in the river at Newtown, preferably every month and report our findings. We will also record them on our web site as part of the Custodians on-going monitoring of the river.so changes in the river. If anyone is interested in taking part in this monitoring, please let us know. 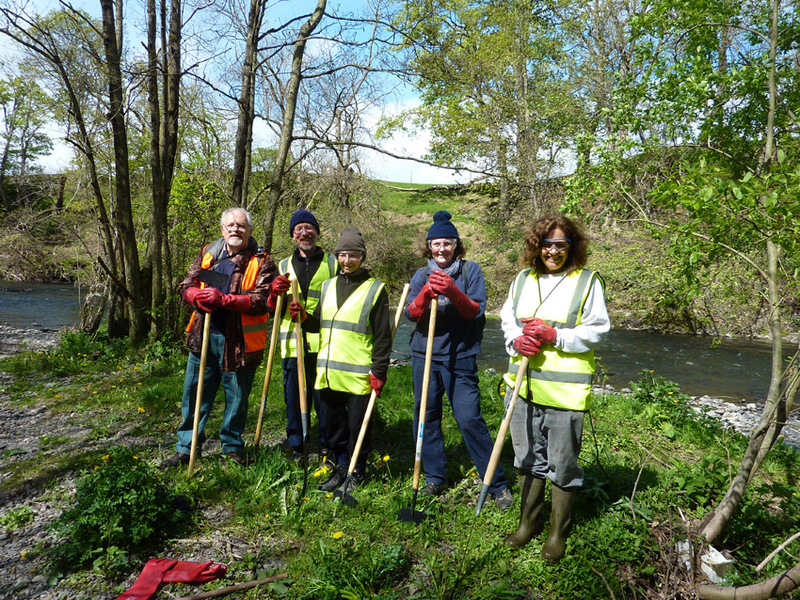 On a hot and sunny Saturday a team of Custodians tackled the on-going problem of Giant Hogweed at Vaynor near where the Mochdre Brook joins the river. Many of these were quite small re-growths, with a few large, mature plants. The general opinion is that we are making progress here and should keep an eye on the area and return when necessary for another assault. Many thanks to the members that joined us in this attack. Wow – What a whopper! I know that he would be the last person to hog (pardon the pun) the limelight, but I felt that I had to show this little clip of Mike dealing with this specimen plant, at the Hate Hogweed event held on 06/07/2013 at Vaynor. There was a lot of good work done elsewhere by the RSC Team and I would prefer to leave it to Mike himself to provide details (in a separate post), of how the event went. See new help section on the About tab. River Severn Custodians Blog | Powered by Mantra & WordPress.